Handcrafted cement tiles from Mosaico. Handcrafted custom-made cement tiles that are made in the UAE are now available from Mosaico, a pioneer manufacturer decorative cement tiles in the GCC, which officially launched its UAE operations last month. Mosaico manufactures decorative cement tiles, using a traditional method employed for almost two centuries. Its tiles are made to order and highly customisable, says the company. Each decorative tile is handcrafted by skilled artisans using an age-old environment-friendly manufacturing process, it adds. “I have always found their characteristics and designs fascinating and when I realised that there was no local cement tile manufacturer in the UAE and that any order had to be shipped from abroad, I decided to start manufacturing them here. The positive response from the regional design and architecture scene has been overwhelming,” she states. According to her, Mosaico tiles are made to order and customers can select every aspect of their tiles from the shape, an ever-growing range of patterns and designs, to a wide choice of colours to adorn each tile. 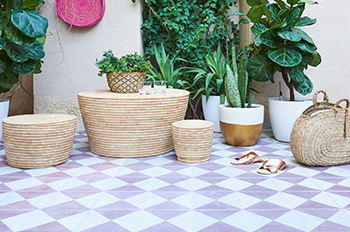 “Customers can also design their own patterns for tiles to be adapted for flooring, wall covering, backsplashes and decoration, both indoors and outdoors. Mosaico tiles can be installed in any space, from private homes, hotels, F&B (food and beverage) outlets to high traffic retail areas,” she adds. South Africa-based Okha’s range of Stellar and Super Stellar candleholders by designer Adam Court draw on both cosmic and cultural references. 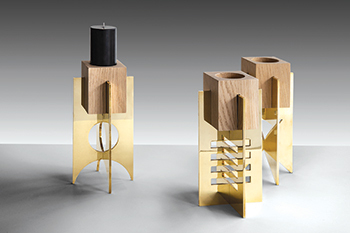 For Court, the Stellar and Super Stellar candleholders are imbibed with “the emotional evocation of starlight, movement, combustion and constellation”, says a spokesman for Okha. “These forms are simplex objects, simultaneously simple and complex,” he says. He has used a name which will remind people of the tragic and sensual women of Tennessee William’s A Streetcar named Desire and Dickens’ Great Expectations applying “the dynamics of opposing forces; two intersecting planes colliding to create new perspectives and alternative dimensions”. The blue and green Stellar have undergone a rigorous process of oxidisation and patination to attain their depth of colour; both are made of mild steel whilst the golden Super Stellar is of solid polished brass, all weighing more than they visually imply. “These are not trinkets to fulfil a passing fancy, but rather they achieve a level of design integrity and value, placing them in the very small and desirable category of objet d’art,” the spokesman points out. The Taormina series by Ritmonio is a design faucet aimed at providing a new balance between shapes and functionality within the bathroom. The series completes and enriches the brand’s offer with products for several uses: from basin mixers and built-in mixers to shower heads for the shower. According to a spokesman for the Italian company, Taormina revisits classic elements in a contemporary interpretation, with graceful lines. “With a clear inspiration from the Sicilian seaside village, which is the envy of the world for its charm and beauty, the Taormina series is the real expression of ‘made in Italy’: the body of the mixer evokes the shape of the characteristic columns of the Ancient Theatre of Taormina and its gentle lines refer to the sinuous shores and waves of the Mediterranean Sea,” he says. Refined design, wide and transverse offer, these are the winning features of the series. It is available with handle without lever – cleaner and more essential – or with lever, to allow the final user a great functionality. 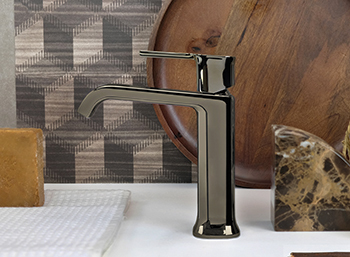 Available in six finishes – chrome, brushed, black chrome, brushed black chrome, gold and brushed gold – Taormina is a versatile solution, respectful of history in modernity. Furthermore, the Taormina series has water-saving features, characterised by Eco for limited water flow of less than nine litres per minute.